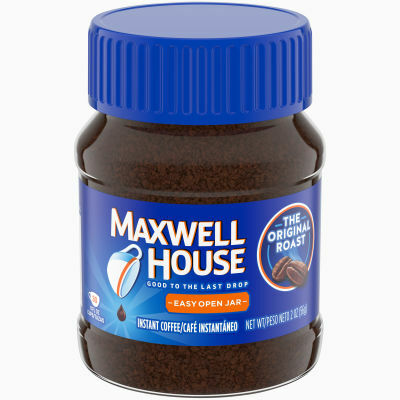 Maxwell House Instant Original Roast Coffee - An American classic, our Maxwell House Original Roast Instant Coffee is made from 100% pure coffee beans so rich flavor is never far away. No coffee maker is required to make our instant coffee. Simply stir in a spoonful and add boiling water. One jar makes 30 - 6 fl ozcups. Smooth and Delightful - Our Instant Original Roast Coffee is medium-bodied and Good to the Last Drop. It delivers smooth, balanced taste in every mouthful. Start your day with a bright and lively cup of this instant coffee and savor its deliciously smooth taste wherever life finds you, at home, work or on the go.